The following day, the pain in the buttocks and legs were getting worse. We had the headwind, which is probably the worst difficulty with pain. 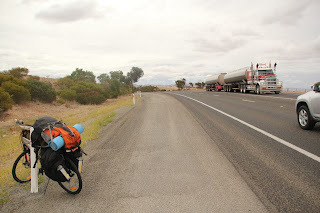 The Second day, we go through Port Wakefield, A gas station you had an encounter with an Australian on holiday wishing repair my bike, so it looks a tool in his box and replace my cables in plastics by iron wires ! Yiiha! Then we cross Lochiel or we take a break near a small chapel, opened with an exhibition of knitwear, I'll look into it and I'll chat with the locals. Woman then gave me the cross hop band, the specialty for easter Day ! then we can celebrate this day! I returned joyfully share this gift with Martin. Arrived in Snowtown, we put the tent at the back of the service station and I got the leftovers after have a little chat with the nice man. We got a shower at the roadhouse of Port Pirie. 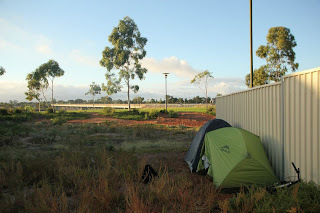 We put the tent at the side of the service station and got again the leftovers ! 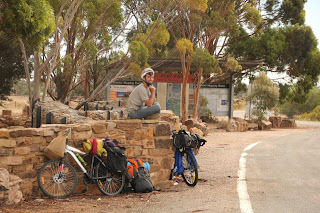 Along the way, we just smelt and see the corpses of foxes, owls and emus. 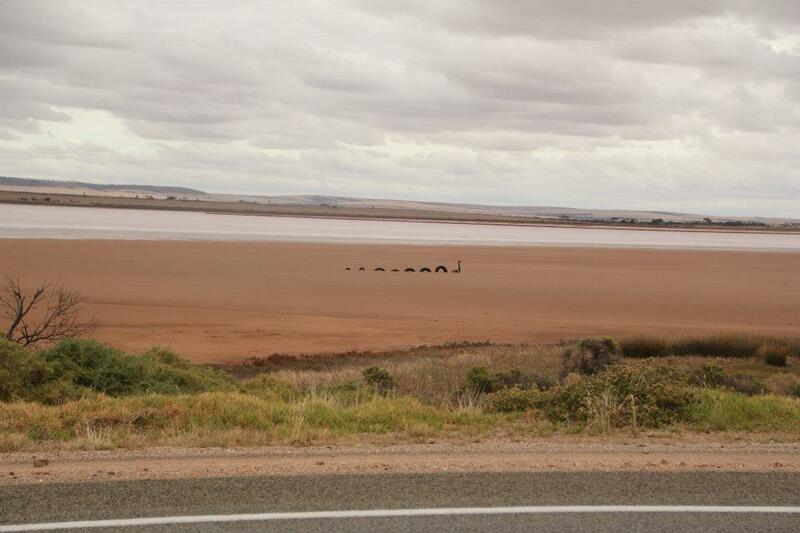 The landscapes are becoming more beautiful and we had the opportunity to see two living emus! 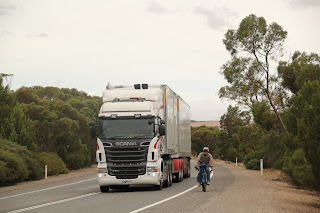 Later I learned that these fruits are called "pademelon" (as the name of a type of wallaby in Tasmania) and it is a inedible fruit, anyway a growing roadside it should not be very healthy. 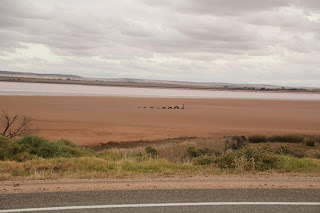 Arrived in Port Augusta, we did enjoy eating ice cream, we looking for a place to put the tents. It's getting dark, and it's time for leftovers, martin install for the tents while I take the bike in search of unsold, I try three service stations that had nothing to give. And I didn't want to return empty-handed, so I thought the places that sell hot foods, I try the supermarket but refused .. and then the gentleman from the security of a supermarket suggests me to ask the restaurant across the street . Apprehensive, I hesitated for several minutes and then I think I have nothing to lose, so I go and ask if they have some leftovers. Negative, disappointed, I am ready rode my bike when a young man of the restaurant took me back, they cook me a wonderful dinner. I come back at the tent with Success and share the Delicious Pasta with Martin. This time, Free Yami takeaway and not a leftovers ! The next day we split up because he needed to go, pressed for time, and I needed my rest, and take time to travel.